The crater which expelled molten sulfur is called "Crater I." The eastern wall of this crater cuts a fumarole area and we can see a vertical section of the fumarole which elongated behind the crater wall. 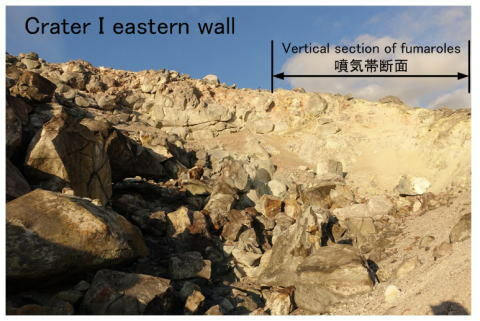 Because the rocks are hydrothermally altered in the fumarole area, altered gravels and small round rocks are observed in yellow sulfur in the right part (southern part) of the eastern crater wall. Instead, on the left (northern part) part of the crater wall large rocks are oberved on this photograph because those rocks are less altered.